bill. She has many high energy bursts immediately followed by a nap. She owns our laps, but we love it. It is her favorite napping position. One of the things she does that still makes us laugh is that she will crawl across the floor on her stomach, pulling herself along with her front legs. When she decides she has gone far enough, she rolls over onto her side with a sigh and takes a nap. She loves her squeaky toys. Sometimes she will pull them all out at once, go from toy to toy, then lies down in the pile of them and takes a nap. When it is cold, particularly in the winter, she likes to take a nap in the sun coming through the window. She will move about the house accordingly as the sun moves and continue to take naps as she goes. Gracie really likes taking naps. Shortly after we got her she started having seizures, but is being monitored by the vet. Her love of chasing after squirrels got her a torn ACL in 2014 and had to have surgery. She recovered very well. We take her camping with us every year and for the most part loves it. It takes her a couple of days to adapt to the new surroundings of the camper and noises of the campground. When we take her for walks, people always think she is a puppy because she is a petite Beagle. When we got her she was 17 pounds, and is now holding her own at 18-19 pounds. 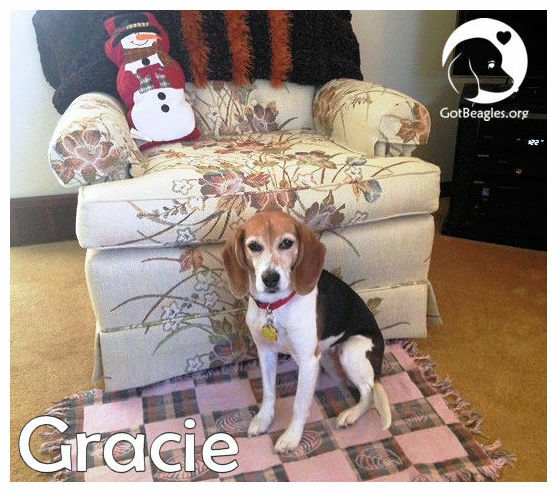 Many thanks to your organization for all you do and for hooking us up with Gracie. It was a love connection from day one and has brought us much joy and lots of laughs. PS. As we write this, Gracie is lying in the sun ... napping!